We're all at some time or another a Muse for each other. Whether that be inspiring others with our creative work or through our words or actions. As long as our efforts come from the heart it's a worthwhile pursuit. Other considerations: This challenge is open to anyone. The only thing you need to do to become a member is make a card and submit it to one of our challenges.You're free to participate as much or as little as you want. You can submit as many cards as you like as long as they are separate submissions. We'll be pulling some of our future designers and guest designers from our club members. So the only way to show your interest in becoming a designer is to play along. It's not mandatory to become a designer or guest designer if you were to be invited in the future. One of our design team members will offer a card for you to interpret each Monday at 9:00 a.m. EST. You can combine with other challenges. We're also encouraging players to use what they have in their stash to make their Muse cards. No need to purchase anything new or use a specific supply. We ask that everyone honor the 3 simple rules. To be fair, if you don't follow the rules you may be disqualified from a Featured Member win or have your submission removed from the InLinkz. Last but not least, please consider turning off your word verification. Thank you. If you don't have a blog feel free to use a Flickr Gallery or other online gallery for your Muse cards. Just copy the URL location of your card in your gallery and add it to the Inlinkz. We have a new Muse Facebook page so you can get updates or special announcements in between challenges. 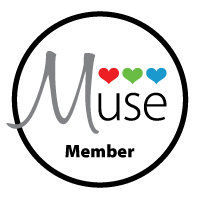 It would be great if you would consider placing a Muse member badge in the sidebar of your blog.